Fill Out Our Workplace Yoga Contact Form to Get Started! Employers, businesses, and corporations are starting to catch on: healthier, happier employees equate to lower costs and turnover. With present day increased work hours, many employees must choose what to cut out from their daily routines to accommodate work demands. The first thing to go typically? Physical activity. This inevitably leads to employees who are more stressed, less productive, and tend to take more sick days. By offering yoga in the workplace, employees can continue to meet the demands of their work load while still maintaining their overall health and well-being. Read more about the benefits of yoga at the workplace here. Where does the yoga class take place? The class is typically provided on-site of your business in a room large enough to accommodate upwards of 10 people. The space is preferably located somewhere quiet. Do employees have to change their clothes to participate? Many businesses allow their employees the opportunity to change into looser fitting clothing to partake in office yoga classes, and many employees can take a yoga class remaining in their business attire. As an alternative, Zen Vibe Yoga offers “office chair” yoga, where the class is led through poses suitable for remaining seated at the desk. How experienced do employees need to be to partake in the yoga classes? 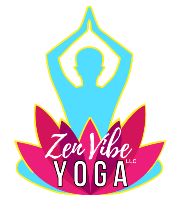 Zen Vibe Yoga provides a Yoga Alliance registered yoga teacher to safely guide your employees through a yoga practice that encompasses all levels of yoga practitioners. This allows employees with both little to advanced yoga experience to participate in the same class. What do employees do in the yoga class? Classes typically focus on poses that take into account common stresses and pains on the body directly correlated to your employees’ office environment (e.g. sitting at desk, lifting heavy objects), and also use breath work and concentration techniques applicable to the employees’ work environment. What type of businesses qualify to host yoga classes in the workplace? We work with all types of businesses! Small and large employers, chiropractor and doctor offices, law firms and insurance agencies, non-profits, schools and athletic teams, and more. Give us a call to discuss your own business’ unique needs. How much does the on-site workplace yoga cost? The price per class is based off of the number of classes booked at one time. We offer discounted packages that consist of 1-2 classes per week for a total of 4 weeks at a time. You can view more on the pricing of yoga at your workplace here.